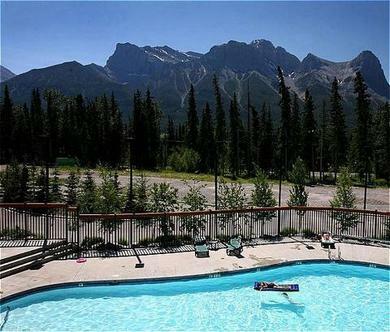 Renting luxurious and affordable condos in Canmore Alberta Canada - gateway to Banff National Park in the Rocky Mountains. The perfect solution to alternative lodging for groups or families seeking the comforts and convenience of home in a refreshing mountain setting. Canadian Rockies Vacation Rentals hosts three locations in Canmore, one of which is the Lodges of Canmore. Our suites are privately owned and therefore each one is uniquely decorated. All of our condominiums are of a high quality in construction, decor and comfort. We hope that you enjoy your time in our area and we are happy to help with the details of your stay with us. General facilities at the Lodges of Canmore include balconies, cable TV, card lock, elevator, fireplace, barbecue, coffeemaker, refrigerator, kitchenette, microwaves, washer and dryer, hairdryer, iron and ironing board, security system, modem jack and underground parking. The Lodges of Canmore are nonsmoking facilities made up of three new builds offering spacious suites many feature vaulted ceilings or lofts. We are walking distance to shop, galleries, restaurants and pubs.